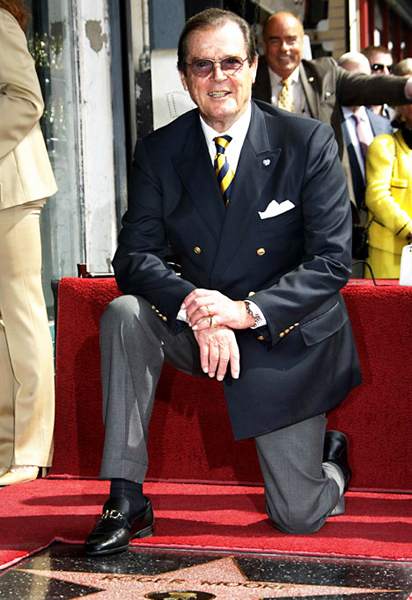 Actor Roger Moore, best known to movie audiences as James Bond, was a friend of Frank Sinatra. They first met in the 50’s at a Hollywood nightclub. It was the scene of a charity fund-raiser that Moore was invited to by Warner Brothers, the studio to whom he was under contract as a young actor. Moore and Sinatra’s paths didn’t cross again until the 60’s when Frank was visiting London and ran into Moore and complimented him on his TV series The Saint. According to Moore, Frank said The Saint was the best thing on TV, and that he watched it frequently with his wife at the time, Mia Farrow. Later in life, Sinatra and Moore’s friendship flourished, with many evenings spent together at the Sinatra estate in Rancho Mirage CA. Moore and his wife at the time Luisa socialized a lot with Frank and Barbara Sinatra. The gatherings also included Gregory Peck and wife Veronique, Cary and Barbara Grant, and legendary agent Irving “Swifty” Lazar. Activities included eating great food, drinking fine alcohol, watching movies and enjoying the swimming pool. Frank had been a swimmer all his life, back to when he used to swim underwater, holding his breath for as long as possible to strengthen his lungs. 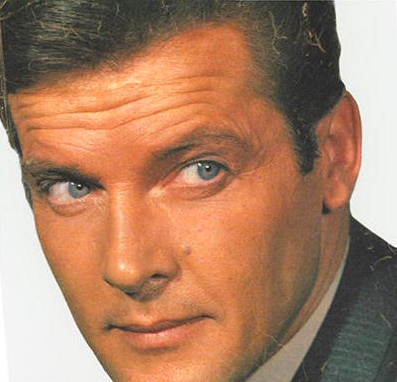 Roger Moore has talked about spending many Thanksgivings and Easters with the Sinatras. He has said that on Easter Sunday, Frank would clear everyone out of the kitchen and cook his favorite dish of spicy meatballs and pasta. He left only one task to his guests, which was to help choose the wine, from what was apparently one of the best wine cellars in the world. One of the highlights of the Frank Sinatra estate in Rancho Mirage CA was Frank’s model train collection that filled one of the bungalows on the property, and there’s a description of it on an earlier post here, dated 5-4-09. For additional photos of the Sinatra estate, visit the home of a Los Angeles based Frank Sinatra Impersonator. And while on the Web, visit the YouTube site of this Sinatra Impersonator.